TASTE Equipment includes CO2 laser marking machine, fiber laser marking machine, ultraviolet laser marking machine and industry-customized automatic laser processing system that are widely used in processing applications such as marking, engraving and cutting of various materials. 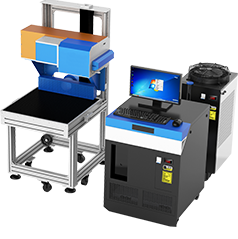 CO2 laser marking machine series is of computer control. By using 10.64um laser beam through beam expansion, focus, and finally by controlling the deflection of galvanometer, the surface of workpiece is impacted based on the predetermined track so that the surface is gasified for marking effect. The whole machine adopts internationally leading folded design with the integrated design of power supply and control part rendering the machine size more compact. The shape is designed by the top designer in Europe. Fiber laser marking machine series mainly includes MINI laser marking machine, Taste laser marking machine, 3D laser marking machine and wide range laser marking machine, meeting different customers' demands of individualized development, safety quality, contour refined processing and scope. Ultraviolet focusing spot is minimal, and the processing heat affected zone is very minimal, so it is mainly used for hyperfine marking, special material marking and engraving, applicable to marking and surface treatment of materials such as silicon wafers, sheet ceramics, various glasses, liquid crystal displays, PCB processing and thin polymer films etc. TASTELASER laser cutting machine series integrates marking and cutting, enabling free switch. The use of imported high-speed head matched with independent R&D 3D software and control system achieves acceleration up to 5m/s, greatly increasing the production efficiency. Industry-specific marking machine series mainly includes intelligent automatic equipment for laser marking such as the jeans laser engraving machine, leather high-power laser marking machine, LGP laser processor etc. specific to particular industries like leather, clothing, mobile phone and advertising lamp box and others. 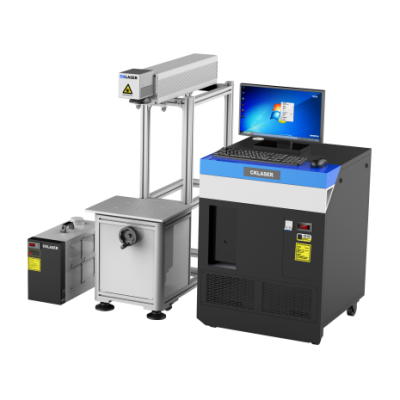 CK-X2 high-speed “flight” marking machine is introduced to you – a full-automated laser marking machine tailored for high-speed operation on assembly lines. It has extremely long “flights” and supports 70 high-speed English flying at the speed of up to 80M/min. It can be used matching any product line for online synchronous marking on the fly to achieve the non-stop automatic production mode and meet the production demands in the industrial automation age. Full-automatic 3D positioning welding marking machine uses three-axis high-precision working table to move freely up and down, front and back and left and right. To break the defects of welding machine disabling patch weld in the past, CKLASER has developed a set of new software control system available for seamlessly connection with high repeatability and significant reduction in material waste. This section introduces the basic principles of lasers and also analyzes the in-depth principle of our 3D laser marker technology. Most laser devices on the market today belong to four types of lasers. If they are used improperly, they may cause certain harm to the human body. Using laser devices correctly can not only protect personal safety, but also help to improve the effects of laser engraving and cutting and save laser processing time. Using laser equipment for material processing will encounter some problems. This section will provide you with basic common problems and solutions. If they are unable to answer your doubts, please contact us. We will serve you wholeheartedly. The application of laser marker has become more and more close to life. Modern people also have a higher pursuit of beauty and art. TASTELASER enables the integration of technology and art, so that intelligent manufacturing leads the trend of the times. 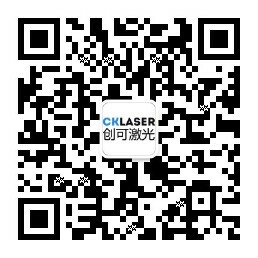 "TASTELASER" is located in Guangzhou city and currently employs 170 people. The technical staff account for 60% of total. It is divided into four product divisions: Fiber Division, CO2 Division, Automation Laser Division and Mirror Optics Division, separately engaged in standard laser. Fast service: Our Company has professional maintenance engineers and equipped with various types of accessories. Full service: We provide customers with a complete set of laser processing solutions, including process test, talent training, and parameter reference and loading of material. TASTELASER provides sample test services such as marking, engraving and cutting of applied materials. Applying online, you can have the opportunity to take three free samples test. The test results will be issued in the form of report. Please call us for more information. Please contact us for any information regarding the choice of the equipment, application of the equipment, material processing, etc. We will provide you with a full set of laser marker solution to answer all your questions about our laser processing and equipment operation. TASTELASER news and information – Provides latest news concerning new product recommendation, events, announcements, notification and how to use our products etc. Suitable for greeting cards, book covers, invitation cards, business cards, gift wraps, tabletop decorations, covers, flyers, and brochures. 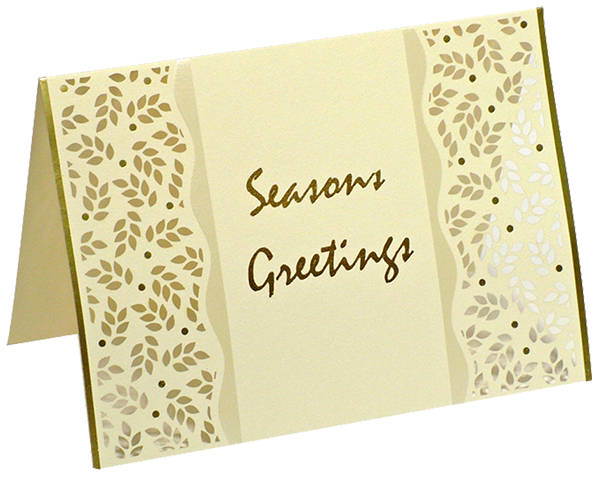 Paper is used for greeting cards, gifts and decorations, and with the hollowing element, the laser technology has brought a richer design inspiration to the world of paper art due to its unique flexibility and precision, which makes the paper fresher and more diverse in its application and embody more beautifully. 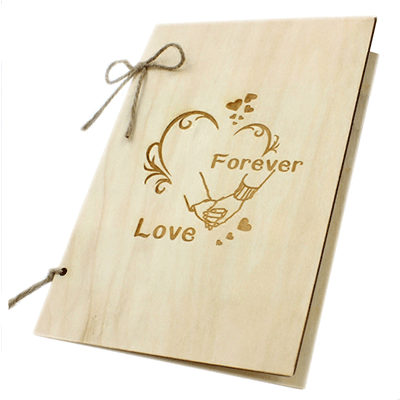 Why choosing the laser marking machine for paper hollowing and engraving? he laser beam hollows out on the surface of paper. The principle of hollowing out is to achieve the hollowing effect, whether by vaporizing the material on the surface layer through a laser beam, or causing chemical and physical changes of it to cause the scratch traces via the light energy. 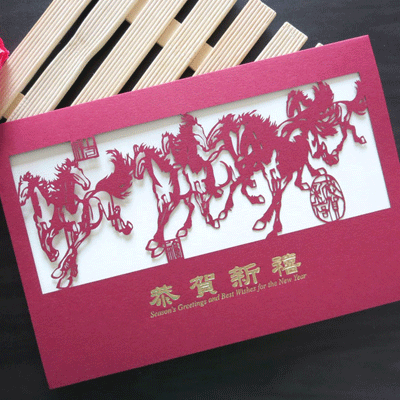 When it comes to laser hollowing for paper cut, what kinds of surprises will occurs when traditional art collide with laser technology, competition or perfect integration? Without any doubt, it will be the latter. 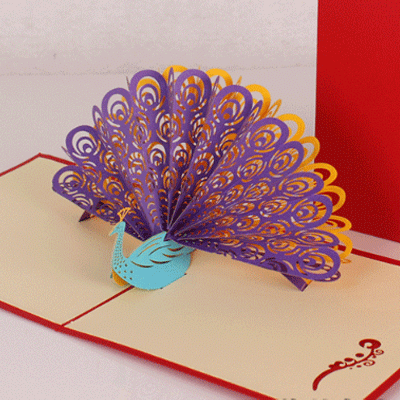 Handwork lies in the creativity. 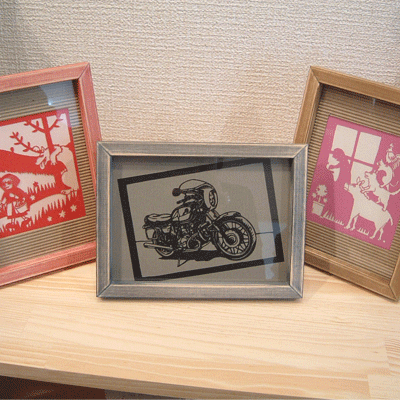 For the handwork with the same cutting method, adopted different techniques presents different cutting effects. In view of this, laser technology can massively produce handwork, and adjust personalised patterns by simply pressing the button for changing. Laser Hollowing for cake tin: Baking small cakes are usually enveloped by art papers, these papers made by the advanced laser technology brings to light many patterns and styles, which are suitable for all kinds of wedding parties, anniversaries, birthday parties, and company celebrations etc. aser hollowing for greeting card: It mainly requires a laser marking machine and the hollowing pattern from the customer, including scenic landscapes, places of historic interest and scenic beauty, cartoons, Christmas patterns, festive patterns, hotels and other precise patterns, which will achieve a hollowing out effect and features of the various landscapes and views. Laser hollowing candy boxes, including European hollowing three-dimensional candy boxes, creative three-dimensional candy boxes, three-dimensional wedding candy boxes which is three-dimensional for lovers, exquisite wedding candy boxes, etc. High power CO2 laser marking machine series are suitable for all kinds of non-metallic materials, such as leather, cloth, paper, PVC, rubber, plastic etc on the surface of the laser engraving and laser cutting; Widely used in shoes, clothing, food, beverage, medicine, daily cosmetics and other industries. High power CO2 laser marking machine series are suitable for all kinds of non-metallic materials, such as leather, cloth, paper, PVC, rubber, plastic etc on the surface of the laser engraving and laser cutting; Widely used for making shoes, clothing, food, beverage, medicine, daily cosmetics and other industries.